I've worked in the maintenance/repair field for forty-five years. Most of that time, maintenance was documented and maintained on paper files. Cumbersome at best. I've looked at many commercial maintenance management systems over the years. Most seemed to be created for the bean counters and not the people getting their hands dirty. What few passable programs I found always seemed to be lacking something. I knew what I needed in a CMMS program but lacked the skills to create something usable. Rob Cochran's SS-CMMS has done exactly that! He's created a user-friendly, compact, quick, and comprehensive program that serves my needs. I'm sure there are many other happy, smiling faces out there that feel the same. Dave S. , Director of Maintenance NMT. Schedule PM's any way you want. By time, meter or manually. Scheduled PM's will automatically generate Work Order's on YOUR schedule. Email notifications available as well! Track and monitize your part usage as you go. You can also view your upcoming PM's on a clickable Calendar. Fully Configurable Reporing: Create reports for WO's, PM's, Parts, Equipment, or Locations. All reports are configurable so you can select exactly what you want and how you would like it sorted. Look up any WO quickly and easily. Track parts, know when to order. Written by a 35+ year maintenance professional, SS-CMMS cloud based Maintenance Management is designed with the maintenance professional in mind. A simple format makes sense and flows easily. Built to do the job without mandatory entries, confusing page layouts and expensive budgets. Absolutely free to try with no limits and full support. It's Simple And Perfect For HVAC Maintenance. We use it for over 300 systems to manage 4 different locations and it works great. We keep up with inventory used and schedule all the maintenance with ease. 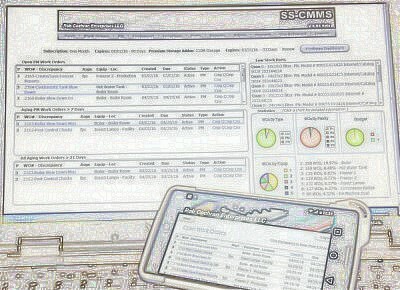 The great thing about SS-CMMS is that it didn't require a lot of training to get started. Oh by the way the price it fantastic also. Thanks for creating a great service. I highly recommend trying this software out in a full use demo for a month. This will get you very familiar with the product before actually spending any money on the system. Through the trial period I was able to get questions answered, just like I had paid for the use. I work for a machine shop and wanted a way to be able to document maintenance as it was required, but also have preventative maintenance scheduled and reminded of when it was time for it to be done again. There are built in reports which allows documentation for the maintenance that has been done and scheduled. Excellent system for the price! Chad A. , Production Manager NM Inc.